Our first full day of chesed took an early start when Ms. Lamm took a group of students to the Kotel early morning for a spiritual experience. After prayers and an amazing breakfast we went to the incredible organization, Meshi, where we were able to spend time with children with different neurological impairments. We were inspired by Elazar, a ten year old child who is only able to use his eyes. He was able to communicate with us through a screen and eye movement, and even though it seemed like he was at a disadvantage in life, he had more emunah and positivity than we thought possible. It showed us that there is always hope, even in a seemingly hopeless situation. 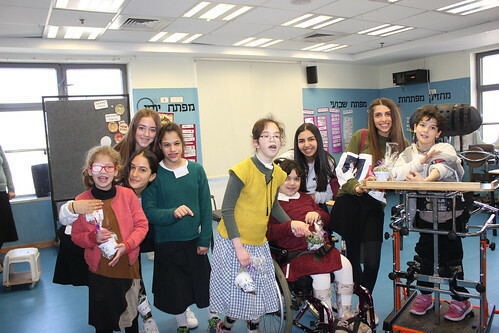 We also got to pair up with the children and create beautiful projects with them for Tu B'Shvat, learn more about their stories, and build a special connection with them. Spending that time with them gave us a sense of gratitude for what we have been blessed with and let us see the great impact we have on others. After saying our goodbyes we headed to Hadassah Hospital where we were able to distribute gifts to ill children of all ages. Watching a smile appear on their faces during their hard times was a very fulfilling and meaningful experience. We then enjoyed a relaxing lunch at the mall inside the hospital. After lunch we all went to Har Herzel, where we paid respects to those who dedicated their lives to our country. We visited many graves and our guide Mayaan was there to inspire us with the fallen soldiers' stories. Using this emotion we prayed Mincha near the graves and said a heartfelt kaddish for our heroes. Following this experience we visited at-risk children from broken homes at the organization Afikim. By interacting, laughing, and creating works of art with these children one on one we were able to bring a little light to their lives and show them that their lives are valued. Leaving the school, we felt a sense of accomplishment, knowing that we impacted these childrens' lives forever.